Dwight Bernard was born May 31, 1952 in Mt. Vernon, Illinois. The six foot two right hander, attended Belmont University in Nashville Tennessee. He was the Mets second round draft pick in 1974 and went 7-4 with the AA Victoria Mets that season. He was promoted to AAA Tidewater the next season going 9-9 behind Craig Swan, Randy Sterling & Bill Laxton. He would pitch at AAA Tidewater for four seasons winning nine games again in 1977 going 9-13. He cracked the depleted Met bullpen in 1978, debuting on June 29th in relief against the Pirates in Pittsburgh. On July 30th, he blew his first save in Houston & took the loss to the Astros. In September he was 1-4, blowing a win & a hold opportunity. He went 1-4 in 1978 making 30 appearances with 26 strike outs & 27 walks in 48 innings with a 4.31 ERA. The next year (1979) got worse as he made 17 appearances, but had a 4.50 ERA in late May when he was sent down to AAA Tidewater. He returned in August going 0-3 with a 4.70 ERA in 30 appearances. He allowed 59 hits & 26 walks in just 44 innings pitched. He was traded to the Milwaukee Brewers in the off season for pitcher Mark Bomback. Bernard toiled in the minors thru 1980 but was a member of the Brewers 1982 AL Championship pennant team. He made 47 appearances, with six holds going went 3-1 with a 3.76 ERA. He saved six games, these came on days when Brewers ace reliever & Hall of Famer, Rollie Fingers was resting. Post Season: Bernard pitched four scoreless innings in the post season, including one inning of relief in Game #6 of the World Series’ against the St. Louis Cardinals. Bernard then pitched in the minors for three more seasons, through 1985. In his four year MLB career he was 4-8 with six saves in 115 games. He struck out 92 batters walked 86 in 176 innings pitched. 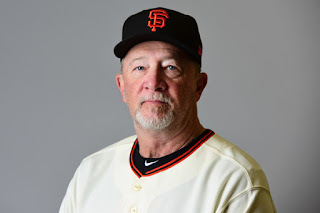 Retirement: Bernard is a long time AAA pitching coaching, within the Seattle Mariners & San Francisco Giants organizations. I didn't know he went on to some success with the 1982 Brewers.But when a team is in a rebuilding stage,its' young prospects take on a higher profile,especially the pitchers.So when I think of the late 70's Mets,the disheveled appearance of this guy jumps to mind as one symbol of a team going nowhere and repulsive to watch: the wonderful Mets uniform graced for a decade by the clean-cut Tom Terrific,then sullied by a weirdo who better brings back memories of those other 1969 events like Woodstock and John Lennon's bed-ins.He's one of those "2-name basis" guys: Say "Dwight Bernard" to anyone who remembers that time and only instant chuckling is the normal response.